Submitted by Tibsie on January 21, 2013 - 1:59am. Is it just me or did everyone else give the mountain a BIG BOOMING VOICE of epicness with the power to cause avalanches?? Submitted by Suilean Dubh on January 21, 2013 - 7:07am. Nope. I gave it this angry hissy little voice. Kind of Gollum-esque but not quite. Submitted by JennaPeterson88 on January 21, 2013 - 2:00pm. Submitted by Rashkavar on January 21, 2013 - 9:42pm. Personally, I read it in the Joker's angry growl from Dark Knight during one of his broadcasts. Despite the fact that the long 'e' on "me" doesn't fit the line. Submitted by psilorder on January 25, 2013 - 5:55am. I read it in the catvoice from when Bill Engvall joked about how the cat acted after castration. Submitted by Llewellian on January 21, 2013 - 2:56am. Submitted by Andrew on January 21, 2013 - 3:22am. It's that way when you're driving through the West. Although I have to say, American mountains are more aloof than Canadian mountains. Also, you'd never see such self centered behavior from oceans and lakes. Although rivers can be chatty. Submitted by CrazyAlmostCanuk on January 21, 2013 - 5:14am. Ain't that the truth, Jam? Mt Baker looks like it's right down the road when the first REAL sunny day comes after the last snow dump. Of course, it looks even better when you get to drive to it, and stamp your feet into the bindings of a good snowboard. Submitted by DSpencer on January 21, 2013 - 6:08pm. I've always wanted to vacation somewhere that I can just look at the mountains for fun. Living down here in FL, looking out across the ocean sort of lost it's appeal after a few years of living here. Submitted by CrazyAlmostCanuk on January 24, 2013 - 9:20am. Drive a bit north, and check out the southern end of the Appies. Lower than the Rockies or Cascades, but still pretty. Ozarks are close enough for a 4 day weekend, too, but they're not as impressive. Submitted by DSpencer on January 27, 2013 - 7:39am. Thanks! It's gonna be about a year before I can do that (school), but thanks! Submitted by CrazyAlmostCanuk on January 28, 2013 - 12:13am. Take a long weekend. If you'e in Miami, you can hit the tail end of the actual Appalachians (not just the foothills) in South Carolina in less than a full day of driving. I made it Atlanta to Miami in just over 10 hours, including rest and fuel breaks, way back. If you have a drive partner, you could leave after last class on a Friday, and be there Saturday morning-ish...do it on a 3 or 4 day weekend, you have time to actually enjoy it a bit. If you're not in Miami, cut the time between you and Miami off the time to Atlanta clock, and add 6 hours Atlanta to Tennessee hill country, or the southern chunk of the Appies, either one. Submitted by Fuseblower on January 22, 2013 - 3:20am. Submitted by kaltic on January 27, 2013 - 3:06pm. Submitted by littlebeast on February 1, 2014 - 2:11am. When I first moved here I wondered whether I would ever get used to the mountains... I never really did. 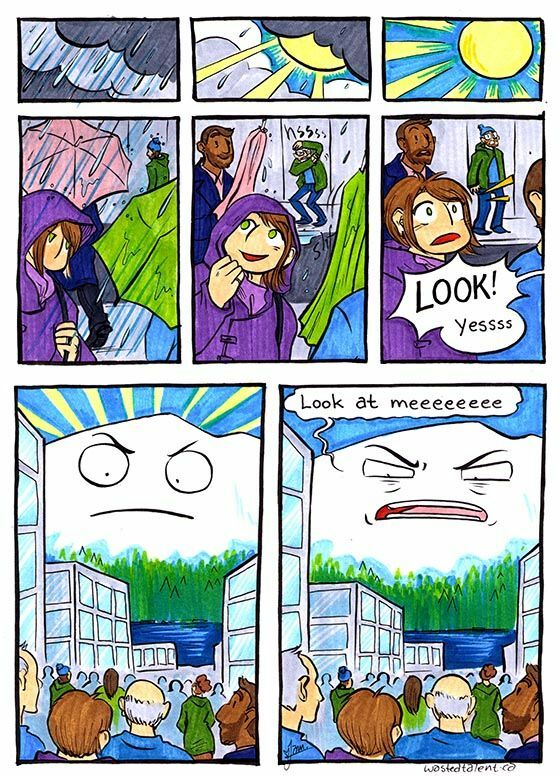 It's especially surprising when they're covered by rainclouds for a few days... or weeks... and then BOOM! Snowcaps.